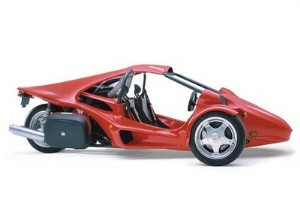 The next item on my to-buy-list is a T-Rex, a three wheeled vehicle that looks nice, has plenty of good features and specifications – one of them is being able to accelerate just like a motorcycle, the tests show that it can go from 0mph to 60mph in 3.9 seconds (that is 96kph for the people that don’t use mph), which is better than most of the “normal” cars. For the looks of it you’d think it is not street legal, but it actually is – all legal (at least in 50 US states) and made within the limits of the vehicle laws, you must wear a helmet and seat belts are a presence on the T-Rex. There is additional equipment that will make the T-Rex look and sound much better, I wouldn’t mind adding the AM/FM/CD XM Stereo option, also a Plasma HID Headlight and Metallic Paint wouldn’t hurt anyone, or would it? If you didn’t like those photos don’t worry because there are more, here are some owner’s photos. More information available at the Official T-Rex Website with a list of USA Dealerships that sell the T-Rex.